For those seeking to embark on a vegan diet or simply reap the health benefits of protein being vegetarian, soy products may be an excellent addition to your diet. Soybeans are the only legumes that provide ample amount of omega-3 fatty acids. Also, they are a high source of proteins and polyunsaturated fats. Soybeans are consumed in numerous ways – roasted, sautéed or boiled. They are often used as meat substitutes especially for vegetarians. All forms of nutrela also known as soy meal maker – big chunks, mini-chunks, nuggets or granules are a line of high-protein foods. They contain a profound amount of protein, which is more than the quantity of protein found in eggs, meats and milk. High in iron, calcium and essential vitamins also. Soybeans are processed into milk, tofu, curd, soy protein and oil. 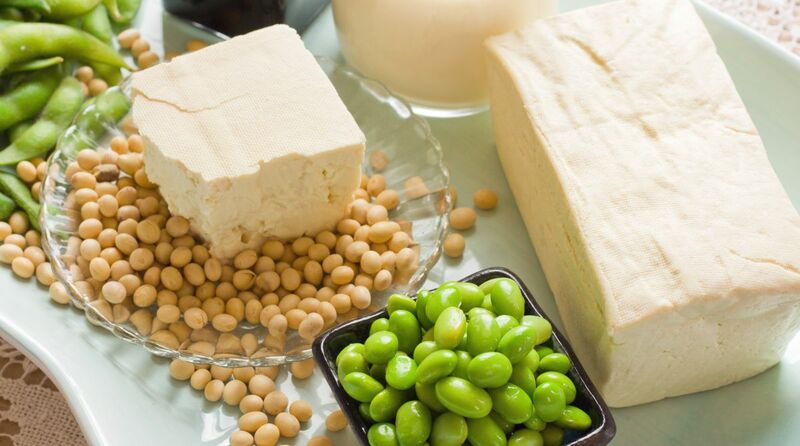 Some popular soy products are – tender green soybeans, bean curd (tofu), soy milk, soy yogurt, soy cheese, soy flour, soy soup, soy nuts, soy chips and other soy snacks. Plain soya chunks are without flavour. They are soaked in water so as to make them soft and spongy so that they can absorb spices, sauces and other flavours well when added to any dish. They are a great addition to gravies, curries and rice dishes. You can also stir fry them to sprinkle over salads. They are a healthy addition to any recipe. · Protect against cardiovascular diseases: Soy is a rich source of omega-3 fatty acids that protects the body from various cardiovascular diseases. It is high in monounsaturated and polyunsaturated fatty acids with zero cholesterol that prevent transportation of cholesterol in blood stream leading to lower concentrations of LDL and increase in the level of HDL. · Strengthen bones and teeth: The phytoestrogen content in soy products helps body to absorb calcium and thus prevents bone mass loss. It also helps in strengthening teeth. Regular consumption can help prevent osteoporosis and arthritis. · Promote weight-loss: Soy products contain monounsaturated fatty acids that can prevent the intestinal absorption of fat aiding weight-loss. They also keep you full for long making you eat less during the day. · Good for ear health: Being rich in iron and zinc, soybean softens red blood cells and expand capillaries stimulating blood supply to the ear. Thus it can prevent hearing loss. · Combat postmenopausal disorders: During menopause, there is a sudden drop in production of estrogens in women’s body. It may lead to obesity, diabetes, heart disease, depression, mood swings, insomnia and various psychological disorders. Soy products contain phytoestrogen, a content that is a potent replacement for estrogens. · Boost immunity: Due to the plant protein present in soybean, it can enhance immune function. · Help combat Alzheimer’s disease: Soy products contain lecithin and phytosterols, both are vital nutrients for brain. Thus it can help combat Alzheimer’s disease. · Loaded with phytic acid: Being loaded with phytic acid that acts as an antioxidant, soy products can help prevent many diseases like diabetes, inflammation, tumour and few cancers. Being rich in polyunsaturated fats, soy can decrease the risk of type 2 diabetes and other problems related to insulin metabolism and blood sugar. · Help combat migraine headache: Soy products contain magnesium that helps combat migraine attacks. · Flush out free radicals from body: Soybean contains antioxidants that cleanse the body and flush out free radicals. · Lower high blood pressure: Being a rich source of potassium, soybean can expel the excess sodium from the body. It can help lower blood pressure. · Provide with young and radiant skin: Soy products contain vitamin E that helps renew dead skin cells and form new skin cells. The phytoestrogen in soybean helps to produce more estrogen in the body to reduce wrinkles and fine lines. Thus it can help you look young and radiant by reducing the visible signs of ageing. Besides including soybean in your diet, you can also apply soy pack on your face and neck to moisturise your skin inside out and reap other skin benefits. · Strengthen nails: Eating soy in any form can strengthen nails and also enhance their shine. You may also dip your nails in soybean paste twice a week to overcome the problem of brittle nails. · Healthy hair with great shine: Eating soy products regularly can strengthen your hair and reduce hair fall. It also helps to make your hair long, smooth and lustrous. You can also apply soybean pack in your scalp to enhance the beauty and health of your tresses in few weeks. · Always discard the water in which soya chunks are soaked or boiled, do not use this frothy water, otherwise it may cause an upset stomach. · Ensure that the quantity of soy products consumed is within the normal range. · If you are allergic to cow’s milk, do not consume soy products. · Due to presence of oxalates, soy products may increase the chances of kidney stones. · Asthma patients are easily allergic to soybeans. Also, patients suffering from bladder cancer or an under-active thyroid should not consume soy products. Enjoy happy, healthy and safe eating!